A teenager with superhuman powers will have no problem fending off a man looking to reclaim his life and two cross-dressing undercover cops at the box office during the extended Presidents' Day frame. I Am Number Four is clearly being set up as a Twilight-style franchise. Much like Summit's cash cow, the DreamWorks release features a shy girl falling for a guy who isn't a normal human. I Am Number Four's ad campaign focuses more on the action elements of the film than it does the romance, which means that it won't end up skewing female as much as the Twilight saga. A strong opening will inevitably lead to talk of sequels, and it'll be interesting to see how the franchise plays out now that Twilight is fading. According to the most recent WebWatch report for unreleased films, I Am Number Four boasts a healthy 6.12% market share of opinions. It ranks behind only X-Men: First Class and Transformers: Dark of the Moon. On Twitter, I Am Number Four trails the likes of Percy Jackson and the Olympians: The Lightning Thief and TRON: Legacy. Not exactly a good sign, but it could rebound. The sci-fi/romance hybrid boasts nearly 210,000 fans on Facebook, which doesn't match the 440,000+ fans that TRON: Legacy had the Wednesday before release. As of 4 p.m. PT, Fandango.com is reporting that I Am Number Four is responsible for 5% of daily sales. That's not bad considering that the Justin Bieber: Never Say Never juggernaut is still overshadowing the competition with 22%. Look for I Am Number Four to win the weekend with $32 million from around 3,000 locations over four days. Unknown will appeal to exactly the same audience that turned Taken—another Liam Neeson vehicle—into a massive $223.9 million worldwide hit. There's no doubt that Warner Bros. has a hit, the only question is whether or not it can match Taken. Reviews are mostly positive, which means that word-of-mouth could be strong. If discriminating critics are fine with a standard action flick then it's safe bet that audiences will love it. According to WebWatch, Unknown holds a 2.51% market share of online opinion. That's healthy for a film that's bound to skew older. Unknown is outpacing Law Abiding Citizen, Edge of Darkness and Unstoppable on Twitter. On Facebook, Unknown's most active page has slightly more fans than Unstoppable did on the Wednesday before opening. Fandango is reporting that Unknown boasts a modest 2% of daily sales. Unknown should muster $25 million from close to 3,000 locations during its debut. 20th Century Fox is hoping there's still some life left in the Big Momma franchise. Martin Lawrence certainly isn't the draw he once was, but familiarity with the series will make Big Mommas: Like Father, Like Son an easy choice for moviegoers. According to WebWatch, Big Mommas: Like Father, Like Son has only a 1.66% share of online opinions. That doesn't bode well. On Twitter, Like Father, Like Son is pacing far behind 2010's Death at a Funeral and Just Wright. Luckily, the most active Facebook page for the franchise has more than 867,000 supporters. Like Father, Like Son has yet to break into the top five sellers on list on Fandango, but that could change on Thursday as more families plan for the weekend. 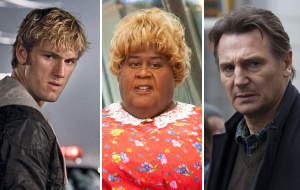 Look for Big Mommas: Like Father, Like Son to take in $24 million from around 2,900 locations over the weekend.